Durable impact resistant plastic with dark transparent cover and off-white body. Accommodates a variety of liquid or lotion soaps. Dispenses approximately 1 cc of soap per push. Large push bar meets ADA requirements. AS30T: 4-3/4" x 6-1/4" x 4-1/2"
AS46T: 5-1/4" x 8-1/2" x 4-1/4"
Accommodates a variety of foam soaps. Easy view of soap supply. Dispenses approximately .4 ml of soap per push. SF2135TS: 4-3/4" x 6-1/4" x 4-1/2"
SF2144TS: 5-1/4" x 8-1/2" x 4-1/2"
Accommodates a variety of liquid, lotion, and antibacterial soaps and synthetic detergents. Valve operation complies with ADA guidelines. 4-3/4" x 8-1/8" x 5-1/4"
8-1/8" x 4-3/4" x 4"
• Surface mounted with concealed fasteners and hinged top for vandal resistance. • Bulk fill dispenser holds up to 48 oz of liquid, lotion, or detergent type soap. • Overall dimensions: 6-1/2" x 7-1/4" x 3-11/16". Bradley offers lotion soap with moisturizer. 1000-shot bottle (P19-232B) or 2000-shot bottle (P19-232A) in case quantity only (4 bottles per case). • Bottles are not refillable. • Soap is manually dispensed by pushing down on the spout stem. • Dispenses liquid and lotion soaps, synthetic detergents, and antibacterial soaps containing PCMX and/or Tricolsan. • Spout and stem are stainless steel. • Spout top is approximately 3" above vanity top. • Standard spout lengths are 4" or 6". • Soap bottle is translucent, shatter-resistant polyethylene and can be ordered in 20 oz or 32 oz capacity. • Dispenser can be refilled by using the included special refill key. • Here's a perfect system to provide ready access to clean hands in high traffic areas. 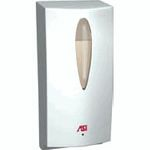 • Buy #SF305 soap or sanitizer dispensers separately at this link. • Buy table top stand, #SF301TT or floor stand, #SF300FL here. • White, high impact plastic, proximity sensor, battery operated. • Tamper resistant soap level viewing window, swing open body with special lock and key. • Overall size: 3-5/8" x 10-5/16" x 4-3/8" (92 x 262 x 111 mm) projection. #A0360 Similar to A0362 except suitable for dispensing lower viscosity soaps. • Stainless steel, #4 satin finish, proximity sensor, battery operated. • Tamper resistant soap level viewing window, removable lid with special lock and key. • 4 7/16" x 9 1/4" x 4 7/8" (113 x 235 x 124 mm) projection. • Capacity: 35 fluid ounces (1000 ml). #A0362 Similar to A0360 except suitable for dispensing higher viscosity soaps. • Capacity: 27 fluid ounces (800 ml) when using disposable soap cartridge (by others) or 30 fluid ounces (900 ml) when using provided refillable soap cartridge. • Suitable for antimicrobial soaps. • 4 13/16" W x 10 5/8" H x 4 1/8" D (122 x 270 x 105 mm) projection. For use with liquid soap. Size is 6 3/4" x 3 1/4" x 5 1/8"
Bright chrome plated metal dispensers are available for liquid or foam soaps. Size is 6 3/4" x 3 1/16" x 6"
Size is 4 1/2" x 9 1/4" x 3 3/4"